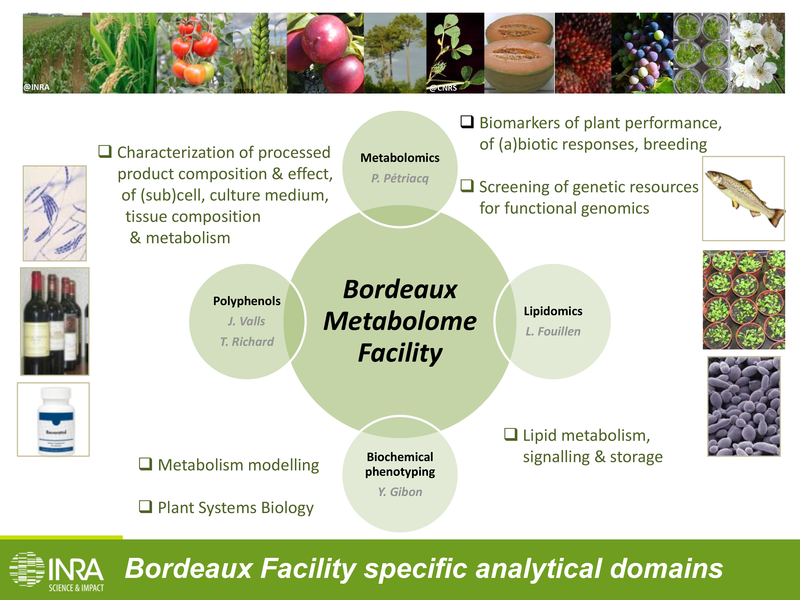 Bordeaux Metabolome Facility provides equipments and expertise for the study of metabolome, lipidome and metabolic fluxes. The Facility is mostly dedicated to the study of plant or plant-derived products. The Facility welcomes about 100 projects each year for about 50 different teams. BioStatFlow, a web application for data analysis. The Facility participates in the development of nmrML language for NMR spectra sharing and re-analysis. The Facility coordinates MetaboHUB National Infrastructure, and participates in EPPN2020 Research Infrastructure funded by H2020 EU programme. The Facility promotes data dissemination and offers assistance for their deposit on trusted repositories (e.g. MetaboLights, INRA-Dataverse). Co-edition METABOLITES issues: "Fruit Metabolism and Metabolomics"